The epee (pronounced “EPP-pay” – literally meaning “sword” in French) is the descendant of the dueling sword, but is heavier, weighing approximately 27 ounces, with a stiffer, thicker blade and a larger guard. As in foil, touches are scored only with the point of the blade, however in epee the entire body, head-to-toe, is valid target – much like in an actual duel. Similar to the foil, the point of the epee is fixed with a blunt, spring-loaded button. However, the epee tip requires more than 750 grams of pressure to register a touch with the scoring machine (basically, epee fencers have to hit harder). Because the entire body is a valid target area, epee fencers do not have to wear a metallic lamé. There is no concept of “off-target” in epee – anything goes. 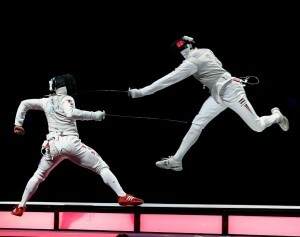 Unlike foil, epee does not employ a system of “right-of-way.” Fencers score a point by hitting their opponent first. If the fencers hit each other within 1/25th of a second, both receive a point – this is commonly referred to as a double touch. The lack of right-of-way combined with a full-body target naturally makes epee a game of careful strategy and patience – wild, rash attacks are quickly punished with solid counter-attacks. So, rather than attacking outright, epeeists often spend several minutes probing their opponent’s defenses and maneuvering for distance before risking an attack. Others choose to stay on the defensive throughout the entire bout. 1996 was the first Olympics to feature team and individual Women’s Epee events.